It’s both easy and tempting to over-interpret Rep. Eric Cantor’s historical primary loss. Beyond that, one interesting issue to come out of Cantor’s totally unexpected defeat is the feasibility–or lack thereof–of the delicate dance the majority leader tried to do: snuggle up real close to business and especially, in Cantor’s case, financial markets on the one hand, and claim far right street cred on the other. One striking thing I failed to notice in this regard—though it was reported—is in the figure below. I’ve been critical of equity markets in recent years in terms of their “efficient capital allocation” function (versus their bubble machine function), but they do quickly process information. 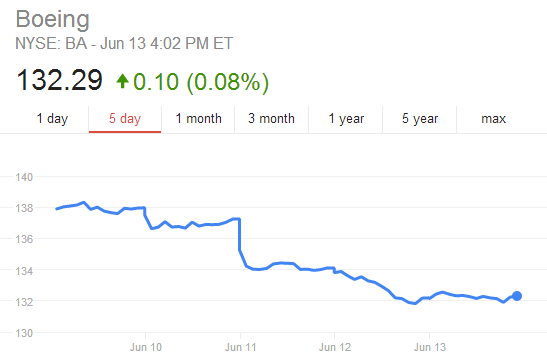 The big dip in figure shows Boeing’s stock price reaction once Cantor’s loss became known. The winner of the VA primary, Dave Brat, attacked Cantor for practicing crony capitalism: using government policy to provide breaks and deals for favored industries and firms, like Boeing, which, as I’ll discuss in a moment, has a long and dependent relationship with the Export-Import Bank (XMB), a government-sponsored credit provider. Surely, one way to view that June 11 negative spike in Boeing’s share price is as a quantification of the validity of Brat’s attack. The question I’d like to tackle here—briefly, as at this point I’m just procrastinating on Sunday chores—is why Boeing and what might this mean for government’s role in the economy? The reason Boeing’s stock tanked on Cantor’s loss is all about the political viability of the Export-Import Bank. One of the bank’s key functions is to provide a government backstop in the form of loan guarantees to loans procured by other countries when they buy our exports. When Indonesia decides to buy $20 billion in jetliners from Boeing, no private bank will undertake that credit risk without adding a phat risk premium to the loan. The XMB exists to obviate that deal-threatening extra charge and thus facilitate the loan, the sales, and the domestic production and jobs that follow. Though it’s been quietly doing its thing since the 1930s, the XMB is under attack by populist Republicans who want to sever any connections between the public and private sectors by denying the bank reauthorization in September. Last time I wrote about this, I stressed that there are “market failures and risks in play here that private investors cannot adequately offset. For one, Europe has its own consortium supporting aircraft manufacturing, Airbus, and those who oppose XM financing here have to be able to explain why it’s OK to unilaterally disarm.” In fact, something like 60 countries have credit subsidy agencies to help boost exports. –There are innumerable ways in which public and private sectors interact, as with the XMB, in advanced economies across the globe. To inveigh against all of them without evaluating the legitimacy of their role in offsetting “missing markets” is economically lazy, short-sighted, and destructive (on the other hand, here’s Joe Nocera, who clearly loves him some XMB!). –That said, the Brat’s of the world [sic] have a point in that for politicians to pretend otherwise, invoking red-meat slogans like “free trade,” “the government doesn’t create jobs,” “the government doesn’t pick winners,” and then support institutions like the XMB is nonsensical. –The XMB needs to diversify, especially re Boeing. For a large, private manufacturer to depend so deeply on government loan guarantees is dangerous and potentially unstable. Imagine the upheaval to communities where Boeing is such a strong presence if the hard right shuts down the bank. OK, I’m out…apparently that grill over there isn’t going to clean itself. Share the post "Cantor and Crony Capitalism"
10 comments in reply to "Cantor and Crony Capitalism"
Brat’s personal political beliefs are totally irrelevant. Republican discipline rules, no matter how decent and thoughtful a person a particular representative is. That’s why the mantra of progressives (and all Democrats, for that matter) must be simple: The only good Republican is a defeated Republican. The disillusioned public that despises all American institutions must be convinced of that — that the only way to change things is to stop voting for the billionaire-loving Republicans by not voting at all. The Democrats are not all perfect, but they are a hell of a lot more interested in helping you than the Republicans. A losing recipe is accepting 37% turnouts in mid-term elections. Normal get-out-the-vote is not enough. The goal needs to be 100% turnout. Anything between 37% and 100% is an improvement. Cantor’s view of economics appears to be cynical and transactional. He enabled loopholes for mega-corporations: he protected the status quo. (He appears to share these traits with Boehner.) It’s all about deals, and who gets the ‘best deal’. ‘Transactional’ economics thinks of economic activity primarily as a negotiation; a lot of ego and aggression is displayed. IOW, transactional economics is not generative. It can siphon public goods to private interests. It can obsess on short-term deadlines. It loves drama. But it is not capable of the kind of original, generative, long-term, patient thought processes that generate new forms of wealth. I have to hand it to those Tea Partiers in Virginia. Speaking as a Left Coast progressive, I have the sense that — like me — they are probably fed up with Hypocrisy Overload and with the sense that economics has become amoral, lawless, and predatory. If that’s what those Tea Partiers objected to, then I tip my hat to them all. The Tea Party nominated Brat. The rest of us threw Cantor out by staying home on primary day(D’s can vote in the R’s primary and vice-versa). He is an embarrassment to the good state. I disagree with: ” Brat may have more in common with populist D’s than many R’s.”. Populist D’s believe in big govt. Big govt ALWAYS involves cronyism. Elizabeth Warren may want to rein in Wall St (over the cries of protest from Charles Schumer), but she is happy to cut crony deals with big labor and the educaional-industrial complex. Brat, a small govt free marketeer, is 180 degrees apart from the democrat (big govt) populists. Thanks for Nader link, watched first 15 minutes, have to get back to work, but will finish later. But why no mention of the role economists play in this obfuscation? This obfuscation couldn’t occur without their cooperation. Economists could easily show this corporate welfare if they chose to do so; nothing requires them to “go along with the ruse” of any tax preference welfare to corporations and oligarchs. The “pie charts” could easily show how all “welfare” is distributed if economists chose to honestly report it that way. By condoning this “cloak of secrecy” economists are all too willing participants in the resulting lack of transparency. Let’s see a pie chart showing total government welfare, including tax preferences, monopoly profits, free insurance for TBTF’s, government sanctioned currency manipulation, and actual distributions to the needy. The lack of transparency exits only because “economic science” supports it – it is a choice, and economists are all too often on the wrong side of full disclosure. That’s the rub of big govt–it seeps into everything—most economists are paid by an entity (including universities) benefiting from welfare. Nobody seems to notice that Boeing is one of the biggest US companies that has managed to avoid paying federal corporate income taxes over the last several years. In fact, according to a published February, 2014 study by the non-partisan Citizens for Tax Justice, Boeing reaped over 7.3 billion in tax breaks during the 2008-2012 period, while actually having a negative federal corporate tax of $202 million on taxable profit of $20.47 billion over this time. Delta Airlines charges that Boeing actually costs the US airline jobs since the foreign airline carriers availing themselves of Ex-Im Banks loan guarantees, etc. increased their plane passenger capacity, which Delta says may have cost the US as many as 7500 jobs. From a tax paying standpoint, competitor General Dynamics paid an average of 29% federal corporate income tax over the same 2008-2012 period according to the Citizens for Tax Justice study. I am not a tea party supporter, and in fact am progressive on most issues, but this kind of corporate welfare extended to Boeing at the same time that it pays little or no federal income tax, is too much for a middle class taxpayer to support. Dems need to recognize that there is a legitimate argument here that needs to be resolved before the Ex-Im Bank reauthorization is permitted. Thanks. Have raised this issue with Sen. Warren (Mass. constituent), as she is on relevant Senate Committee.